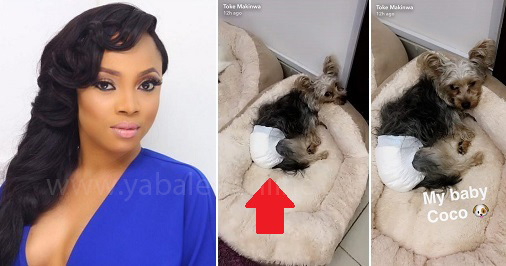 Toke Makinwa is currently under fire on Social Media after she shared a video on Snapchat about her dog “being on her period”. In the video, she said: “Someone is so unhappy because she’s wearing diapers, Coco you’re on your period, and you keep staining my whole house.. OMG she’s so sad”. 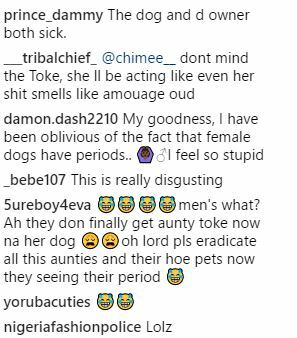 Folks on social media have called her out to return the poor dog to wherever she got her from, as female dogs are “never on their period”.. 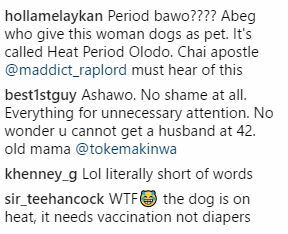 Instead, they’re on “heat.” ..and she never should have worn a diapers for the dog, instead, she needs vaccination. They advised her not get her pet a male dog to mate with it.